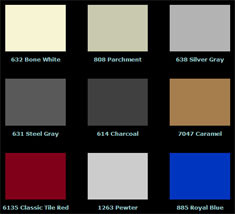 This section describes some of the common characteristics that owners notice. It might include a disclaimer: Even the best laid concrete slabs eventually exhibit some random cracking and variations of flatness that are usually related to changes in moisture content. All concrete shrinks as it dries. This is due primarily to loss of moisture. 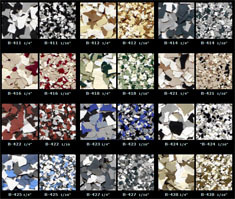 Drying and shrinking occur over a long period of time, with thick slabs normally shrinking more slowly than thin slabs. Once concrete has taken initial set, it is said to enter the hardened state. Roughly 30-40% of shrinkage occurs in the first month. Another 50% of dry shrinkage occurs in the next 11 months and the remaining in the second to third year. In slabs on grade, the top portion of the slab shrinks more than the bottom. 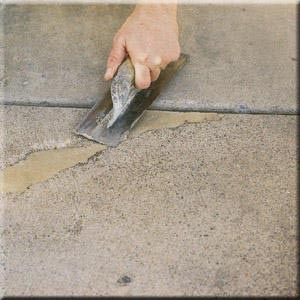 Thus the edges or corners of the slab at joints or cracks tend to curl upward. Curling is a natural phenomenon that causes concrete at joints to be slightly higher than the rest of the floor, especially where joints intersect. 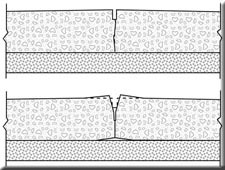 Shrinkage and curling induce tensile stresses in the slab. Concrete is weak in tension so when the stress exceeds the tensile strength of concrete, the concrete cracks. To minimize such cracking, joints are incorporated in the floor to create planes of weakness where the cracks will occur. Nevertheless, some cracking should be expected, otherwise no reinforcement would be needed. Reinforcing steel is incorporated in slabs on grade to minimize crack widths and vertical displacement cracks. Floors may settle due to consolidation of the sub grade soil or the sub base. 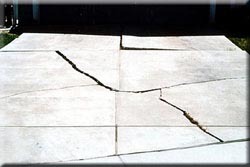 Differential settlement can cause cracking, faulting (differences in floor elevations at a crack or joint) or unleveled floors.